When a user visits www.bdfa-uk.org.uk we collect standard internet log information and details of visitor patterns. We do this to find out things such as the number of visitors to different parts of our website and this tells us the information that is useful. We do not collect information that identifies anyone. We do not make any attempt to find out information on who is visiting our website. We do not collect personal information through our website. Cookies are used within the website to ensure that the website works as it should. The website will not work properly if these are not used. These include login cookies allowing access to the content management system. 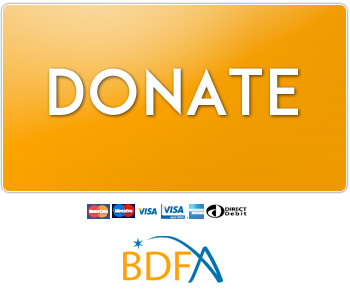 BDFA may hold the details of the visitors who request information on the work that we do. These details may be used to contact these people at a later date. If BDFA or its assets are acquired by a third party, personal data held by it about its customers, will be one of the transferred assets. BDFA store all information lawfully and in accordance with the protection Act 1998 in the UK and the Data Protection Act 1988. The data that we collect and process is stored on servers held within the UK. There will be a nominal fee of £10 for administration fees. In order to change your details or opt out of marketing emails and future communications you must make sure you call BDFA on 01252 416110.